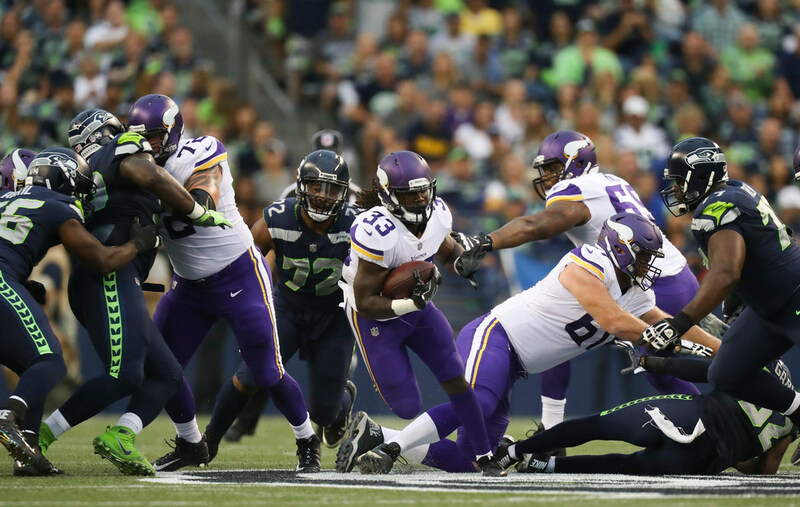 The Vikings’ perfect preseason ended in the second game during a 20-13 loss to the Seahawks on Friday night. So let’s update our Vikings stock watch after the exhibition. 1. RB Dalvin Cook: Cook broke arm tackles on his way to picking up 33 yards on three consecutive carries against the Seahawks, showing off his combination of power and elusiveness once he finds a seam. Cook’s production came behind a patchwork offensive line that expects to return two of its starters — Alex Boone and Riley Reiff — for the next preseason game on Aug. 27. 2. DE Ifeadi Odenigbo: The rookie seventh-round pick kept hearing his name called during the second half. Odenigbo started with a third-down sack on Seahawks quarterback Trevone Boykin and continued with two run stops on the following series. Odenigbo added another quarterback hit and a forced fumble in the fourth quarter. The Vikings could face some tough decisions with their defensive end depth. 3. Offensive line: Cook picked up gains of 9, 9 and 15 yards from three different spots in the offensive line. That’s a good sign against the respected Seahawks defensive front. Rookie center Pat Elflein appeared to have clean snaps and, above all, Bradford managed to stay clean without a sack on 12 dropbacks. Right guard Joe Berger and right tackle Mike Remmers had solid blocks to spring Cook on a nine-yard gain. 1. CB Mackensie Alexander: Alexander lost sight of Seahawks receiver Doug Baldwin, who slipped behind the Vikings slot corner for Seattle’s biggest play from their starters. Baldwin gained 37 yards on a catch and run out of the slot, where the Vikings are expected to start Alexander in his second NFL season. The talented cornerback experienced some growing pains in Seattle. 2. QB Sam Bradford: Whether it’s on the center or the quarterback, the red-zone delay of game penalty will fall on Bradford’s shoulders. The Vikings’ opening drive stalled after Bradford, who did make the gutsy 39-yard completion to Stefon Diggs while being drilled, was pegged for delay of game to force third-and-20 (after Kyle Rudolph was flagged for a false start). Bradford then had a couple questionable throws in the second series. He seemed to force a pass to Diggs down the sideline, which was nearly intercepted by Richard Sherman. Then Bradford overthrew Cook in the flat on third-and-9. 3. Returners: Little clarity was gained in the kick returner competition. Running back Jerick McKinnon led the way, but was corralled at the 12-yard line on his only attempt. Then rookie receiver Rodney Adams fumbled the third-quarter kickoff out of halftime to set up a Blair Walsh field goal for the Seahawks. Adams returned two kicks for 13 and 21 yards.